On October 28, 1944 , Flight Petty Officer 1st Class Isao Matsuo took off from Nichols Airfield in the Philippines as pilot of a Suisei Dive Bomber (Allied code name of Judy) loaded with a 500-kg bomb. He was a member of the 2nd Kamikaze Special Attack Unit Giretsu Squadron from the 701st Naval Air Group. He died in a special (suicide) attack at the age of 23. He was from Nagasaki Prefecture and was a member of the 6th Hei Class of the Navy's Yokaren (Preparatory Flight Training Program). Please be glad. I have obtained a splendid place to die. This is the last day. The Empire's destiny lies with this battle. In the decisive battle for Greater East Asia, I will fall like a flower in the skies of the southern seas. I shall be a shield for His Majesty and die bravely along with my squadron leader and others. I will be born seven times, each time to destroy the enemy. Ah, what is there besides this that surpasses it as the long-cherished desire of a young man? I am very deeply grateful for you who raised me for a long time to become strong, the gift of my squadron leader and more experienced officers who raised me as their own son and gave me guidance, and the gift of demanding training. I warmly thank you for bringing me up well for 23 years. This present deed will repay your kindness. Please praise me for dying well for the country in an honorable way. Among my brothers and sisters, I truly was a happy person. Please be glad. I am asking that you please have my younger brother also be able to serve as an honorable military man. Father and Mother, soon I will return in a white wooden box . We will meet each other at Yasukuni Shrine . Thank you for everything that you have done for a long time. Please take good care of yourselves. Ah, the heroic jibaku (self-explosion) unit of the Special Attack Corps 5th Giretsu Squadron with its Suisei Dive Bombers will dive on enemy aircraft carriers where we are heading. Since our last images have been captured on camera, before long please watch us at leisure at the movie theater. Please see 16 smiling bomber crewmen who are brave warriors. Ah, special attack that will break into pieces as a jewel. Matsuo wrote the following poems. The first is a tanka (31-syllable poem with a syllable pattern of 5-7-5-7-7), and the second is a haiku (17-syllable poem with 5-7-5 syllable pattern). The letter and poems come from Kitagawa (1983, 68-70). The biographical information in the first paragraph comes from Kitagawa (1983, 68) and Osuo (2005, 159). The English translations of Isao Matsuo's letter and poems in Inoguchi and Nakajima (1958, 200-1) were considered for this page's translation. There are a few sentences missing in Inoguchi and Nakajima, and these have been included in the above translation. Some phrases have been added to the translated sentences in Inoguchi and Nakajima, and these generally have been omitted for this page's translation. 1. Osuo (2005, 159) and Tokkōtai Senbotsusha (1990, 131) both indicate that the date of Isao Matsuo's sortie was October 27, 1944, but the letter has a date and time (0100 on October 28, 1944) that does not make this possible. Kitagawa (1983, 68) gives the sortie date as October 28, 1944, which is consistent with the date of the letter, but this date could not be confirmed by another source. 2. A white wooden box was how the Japanese military usually delivered the remains of war dead to their families. In the case of kamikaze pilots, the remains such as fingernails or hairs from the head often would be prepared in advance. There are also cases where the white box would arrive at the family's home with no remains. 3. Yasukuni Shrine in Tōkyō is the place of enshrinement for spirits of Japan's war dead. Inoguchi, Rikihei, and Tadashi Nakajima, with Roger Pineau. 1958. The Divine Wind: Japan's Kamikaze Force in World War II. Annapolis: Naval Institute Press. Kitagawa, Mamoru, ed. 1983. 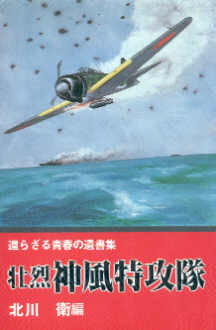 Sōretsu kamikaze tokkōtai: Kaerazaru seishun no isho shū (Heroic Kamikaze Special Attack Corps: Collected last letters of youth that would not return). Tōkyō: Nihon Bungeisha. Osuo, Kazuhiko. 2005. Tokubetsu kōgekitai no kiroku (kaigun hen) (Record of special attack corps (Navy)). Tōkyō: Kōjinsha. Tokkōtai Senbotsusha Irei Heiwa Kinen Kyōkai (Tokkōtai Commemoration Peace Memorial Association). 1990. Tokubetsu Kōgekitai (Special Attack Corps). Tōkyō: Tokkōtai Senbotsusha Irei Heiwa Kinen Kyōkai.